Matilda Mae was 9 months old when she tragically died from SIDS and her family has worked tirelessly to raise awareness and funds for The Lullaby Trust ever since. I never met Matilda Mae, but through her mum Jennie’s writing (in her blog Edspire), I find myself touched my Matilda’s story every day. As a mum, to imagine what this family has gone through is almost impossible to bear. This makes what this family has managed to accomplish, whilst grieving, in the last 9 months, even more mind blowing. To be able to create something positive out of such dark times is quite simply amazing. The Welly Walk was held at Beale Park in Reading. After a musical gymboree warm up, we set off on the Welly walk. The route was through lovely scenery and was lined with purple and pink balloons, Jennie and family led the way. 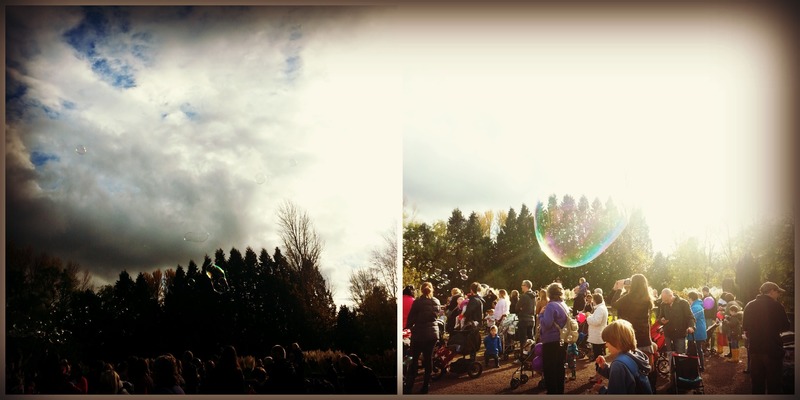 Then we gathered outside the Pavillion to blow bubbles and listen to the most amazing classical musicians. Baby loved the bubbles. Then there were various activities that you could take part in for the afternoon. We took Baby for a walk as she really needed a nap and we wandered around while she snoozed. It was lovely just to have the time with Mr Hubby to just be and not worry about anything or feel like I should be doing something. When Baby woke up we took her to the playground. She had a lovely time and had her first go on a swing, slide and ride on animal. She had such fun!. It was our first proper whole day out and I was so proud of our little girl as she didn’t grumble and was a joy to be with all day. Mr Hubby couldn’t resist taking some more pictures of her. We always lift her up and tell her she is the tallest baby in the world, so Mr Hubby thought he would check! Then, various prizes were given out and thanks were given. I was in awe of Jennie’s courage, what an inspiration. I have no words, yet I had to say something, in the end a cuddle was enough. When we left we were given sparklers to light for Tilda. I must admit by this point I was quite emotional, but the day was one to remember a special life taken far too early and was a day of joy and happiness.